The charming Les Fermes de Marie consists of nine chalets in the heart of Megeve, each constructed using materials from centuries old High Mountain pasture chalets. One of the most luxurious accommodations in Megeve, Les Fermes de Marie is the perfect option for couples, who can retreat to the spoiling Pure Altitude Spa, and families, whose little ones can enjoy the facilities of the Hameau des Enfants. Guestrooms and Suites are cosy, with exposed wooden beams, antiques and warm linens with classic checked prints. Most rooms and suites, except Classic and some Club rooms, offer a private balcony or terrace, from which to enjoy the mountain views. Lounge Area and Prestige Rooms offer additional living space, and can also accommodate children, making them a good family option. All guestrooms and suites are en suite, with a shower in Classic Rooms, and tubs in all other guestrooms and suites. For larger families or groups of friends, the luxurious private Chalets - des Fermes, and Chatel - provide privacy and space, whilst still offering the facilities and service of a five star hotel. There are a variety of dining options, from hearty yet healthy oven cooked meals in Restaurant Traditionnel, to Alpine specialities (cheese fondue and Mont Blanc Gateaux anyone?) at Restaurant Alpin. La Salle a Manger offers a fine 'Truffle Menu' during the winter months, or for a unique experience, dine at L'Alpage des Fermes de Marie, a refurbished yet rustic mountain pasture chalet. A library and bar provide ample relaxation space, whilst budding culinary wizards can enjoy a cookery class at L'Atelier. There is also an on-site ski shop. Post-piste relaxation takes place at the Pure Altitude Spa, where a range of treatments are offered using products created from mountain plants and natural essences. For the little ones, retreat to the Hameau des Enfants, where the 'kids concierge' will ensure every playful whim is catered for. 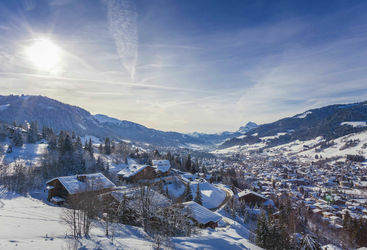 The beautiful wooden frame buildings that house the accommodation are all traditional high alpine pasture chalets that were painstakingly taken apart, numbered, transported and lovingly reconstructed in the heart of Megeve. Chalet Zannier is a thoroughly sophisticated boutique bolthole in the charming Alpine village of Megeve, just over an hour from Geneva. Harriet and Kate L are our 'Les Fermes de Marie' experts and as seasoned travellers they have the inside track on the most memorable adventures.